[PRESS RELEASE] Ft. Collins, CO, November 5, 2012 – The holiday season is coming up, and NewBelgium.com offers Belgian glassware and philanthropic giving for the savvy shopper. 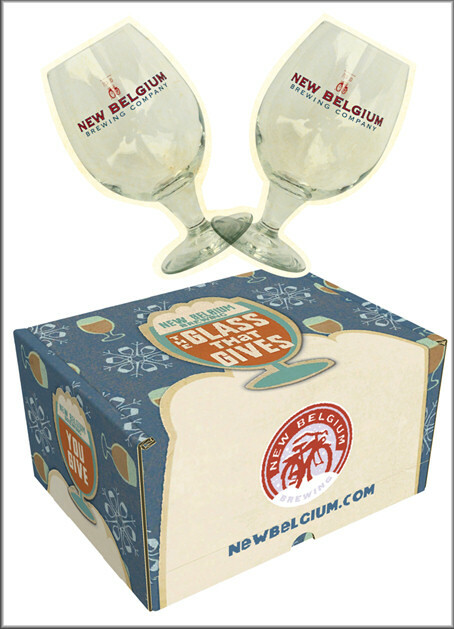 For the second year in a row, New Belgium Brewing, maker of Fat Tire Amber Ale, is hosting its “Glass That Gives” program, in which the purchase of the brewery’s nucleated Belgian globe glasses benefit nonprofit organizations. Each fanciful two-pack gift box is available for $8.99, with $1.00 from each purchase going to one of four beneficiaries. • 350.org (www.350.org), which is building a global grassroots movement to solve the climate crisis. Founded in 2008 by a group of college friends and environmental writer and activist Bill McKibben, it has coordinated over 20,000 climate demonstrations in more than 182 countries. • National Sustainable Agriculture Coalition (http://sustainableagriculture.net), an alliance of grassroots organizations that advocates for federal policy reform to advance the sustainability of agriculture, food systems, natural resources, and rural communities. Purchasers can direct their dollar to any of the nonprofits listed above. To up the ante, New Belgium will offer website visitors the opportunity to create and share online holiday greeting cards. Using a mash-up of images, users can custom-design their card and for each card sent, New Belgium will donate $1.00 to the charitable cause of your choice. Cards can be shared via e-mail, Facebook and Twitter. The best of the best will appear in New Belgium’s online gallery alongside interactive short videos and animations. New Belgium’s globe glasses have set a standard for stylish and functional sipping. Built from stem to lip to enhance the beer tasting experience, the globe shape captures and directs the beer’s aromas toward the nose, while a narrow opening benefits the foam. The logo etching on the bottom of the glass provides nucleation, which is designed to refresh and release flavors and create a continuous stream of bubbles. It’s all balanced atop a sturdy stem to keep hands from warming the beer and allow for unobstructed viewing. The glassware is available in two sizes: the slightly smaller 12/14 oz. glasses (12 ounces to the line, 14 ounces to the top) and the classic 16/18 oz. globes (16 ounces to the line, 18 ounces to the top). Join New Belgium’s online holiday festivities at www.newbelgium.com to buy globes and other souvenirs. The glassware is available through December 31.